When looking to get the most out of your speakers, consider a separate power amplifier, rather than a receiver that comes built-in. A separate amp or power amplifier is the secret weapon in your audio setup, as it allows you to add more power to your signal. Denon is a leader in home entertainment tech. Their talented engineers continue to put unique technologies and decades of expertise into every piece of equipment they produce, including amps. We highly recommend the DCD2500 and PMA2500 CD player/amplifier combo as a great first buy for a home entertainment space. 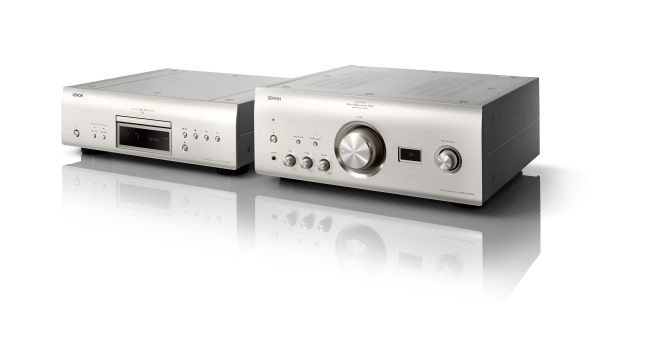 The DCD2500 does what a disc player should do – provide ultra-high precision in reading discs and supplying high-quality audio signals to the amp. What makes this possible is the fact that the signal paths have been designed to be as short as possible, thereby minimising the whole circuitry. Let’s get to the good part – the integrated amp. The performance of the PMA2500 goes well beyond expectations and any of its predecessors. It’s a true masterpiece of audio quality. Thanks to the rear USB-B input and embedded high-quality D/A converter, the PMA plays high resolution files up to 384kHz/32bit and DSD up to 11.2MHz from a computer in impeccable sonic quality. For the best performance from analogue inputs, the PMA features an Analogue Mode which allows you to switch off all unutilised sections, like the digital input circuitry or the low noise display, for an unaltered audio reproduction. Rotel is also top of their game and one to ask for when shopping for power amplifiers. The RB1582 Mk|| power amp is boss when it comes to driving the very largest stereo systems effortlessly. It’s the amp’s 200 watts per channel which provides the massive current to achieve this. The RB-1582 MkII‘s incredible performance begins with an extremely large toroidal transformer combined with a total of 60,000uF storage capacity in special “slit foil” capacitors to provide 100% stable power to the output stage. With the ability to charge and discharge super quickly, slit foil capacitors ensure signal fidelity during orchestral crescendos or repetitive kick-drum impacts. Anyone who is serious about the quality of their music would be mad not to check out this power amplifier from Rotel. Need a headphone amp? Look no further than the Klipsch Heritage Headphone Amplifier. Not only do you get that exquisite vintage look and feel with genuine walnut veneer, but you’re also guaranteed an exquisite audio experience. The Heritage Headphone Amplifier doubles as an ideal processor of any digital source, whether the output is a pair of headphones or RCA line-out. Staying with Klipsch, the KDA-500 CE amplifier is another powerhouse of legendary Klipsch performance and comes in a sleek, high-tech, 1-rack unit solution for any type of installation. Contact us to find out how to really amp up your audio. This entry was posted in Amplifiers. Bookmark the permalink.